There are very few Wild Turkey KSBW expressions that grab my attention like Wild Turkey 101 12-year. From Beyond Duplication and “Cheesy Gold Foil” bottles, to “Split Label” and various export-only editions, Wild Turkey 101/12 is unquestionably spectacular bourbon whiskey. Unfortunately, as with so many other legendary Wild Turkey expressions, 101/12 is no longer in production. Sure, there’s the 13-year Distiller’s Reserve. It’s fine for what it is (a mature, yet notably lighter expression), it’s just not the same as Wild Turkey 101 12-year. Not the same league; not the same ballpark. The history of Wild Turkey 101 12-year traces back to about 1980 with the release of Beyond Duplication. Around 1985, the domestic market saw the 101/12 label redesigned to what’s now universally known as “Cheesy Gold Foil,” or “CGF” for short. In contrast, the export market continued with the Beyond Duplication label for at least four more years. In 1992 the domestic 101/12 label changed from CGF to the “Split Label” design (so named for its front label that’s literally split into two sections), while foreign bottles continued with the CGF label into the mid-1990’s. By 1999, domestic distribution ceased for Wild Turkey 101 12-year. The export market, however, flourished with 12-year Wild Turkey for another 13 years. In that time three export-only labels were issued: “Pseudo-Split Label” (abt. 1999-2005), “Uni-label” (abt. 2005-2011), and the monochrome label based on the 2011-2014 Campari mass redesign for all Wild Turkey core expressions. 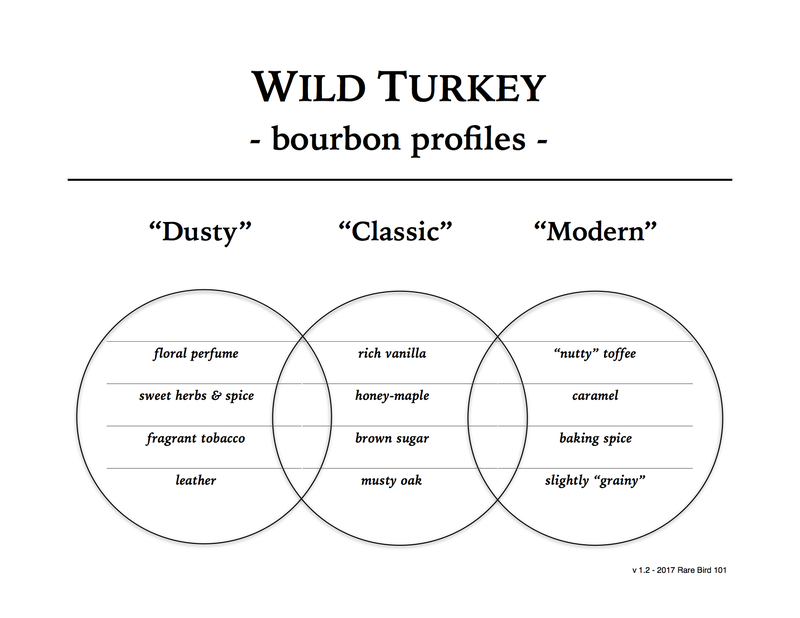 Similar to domestic NAS and export 8-year Wild Turkey 101, profiles varied by year and batch, and subsequently moved from more of a dusty-based profile to that of a robust classic profile. Regardless of label, nearly all 12-year WT 101 bottles were (and remain) top-quality pours. But as the saying goes, all good things must come to an end. Wild Turkey is no exception. By 2013, Wild Turkey 101 12-year was discontinued worldwide. While plenty of bottles remained in the foreign marketplace in the years immediately following, it didn’t take long for the global bourbon community to move from Stitzel-Weller hunts, to Wild Turkey hunts. Finding any Wild Turkey 101/12 label at retail nowadays is highly unlikely. That said, 101/12 bottles of all labels can be found on secondary markets. You just have to spend a little time searching and accept that pricing will be far from standard retail. Or you could just fly to Japan and hope to get lucky. Overall: If you’re looking for dusty profile Wild Turkey 12-year, such as the likes of CGF or Split Label, you’re not really going to find it here. That said, it’s a hands-down incredible pour – a near-perfect representation of the classic Wild Turkey profile with a touch of modern Turkey for good measure. In many ways it reminds me of Russell’s Reserve 2002, yet sweeter and more refined. I’d even go so far as to say that this 101/12 has a nicer finish, as there’s no dry or astringent oak notes like I find laced in 2002. As I blissfully sip this Wild Turkey 101 12-year, I can’t help but wonder why we no longer see this on the market – export or domestic. Sure, there was a period of time when stocks were likely low, a direct result of the bourbon boom that started in the late 2000’s, but it’s now 2018. Production has steadily increased and there’s more Wild Turkey barrels and rickhouses than ever before. Further evidence can be found in modern well-aged expressions. Russell’s Reserve 10-year is practically everywhere and countless Russell’s Reserve Single Barrel selections routinely push 10 years in maturation. In the last year alone we’ve seen the aforementioned Russell’s Reserve 2002 (15-year KSBW), Master’s Keep Decades (10 to 20-year KSBW), and Master’s Keep Revival (12 to 15-year sherry-finished KSBW), so mature stocks clearly exist at Wild Turkey. While I appreciate the creativity and experimentation recently displayed by Master Distiller Eddie Russell (really, I do), I’d happily sacrifice a little of that (just a little) to see Wild Turkey 101/12 back on retail shelves again. It wouldn’t have to be a regular release either. As Bobby Childs from Adventures in Whiskey recently remarked, once a year, maybe around Christmas. Personally, I think an annual release would be perfect. Hell, give the CGF or Split Label design fresh takes and you’d probably have an even hotter item. But speaking truthfully, you could fill a cheap plastic travel bottle with 101/12 and I’d buy it without hesitation (at a premium, no less). Ah yes, a retail shelf lined with Wild Turkey 101 12-year would be so very nice, but alas I must pinch myself. The more time I spend on this blog the more I understand how this industry really works. There’s us, there’s the distillery, and there’s corporate. While I’d like to agree with Meat Loaf in thinking two out of three ain’t bad, in this business, when it comes to what consumers actually want, it’s three out of three or zilch. A shelf lined with 12 year 101’s – that would be wonderful! Hopefully, someday. Great article! Thanks Jon. Yes, it seems a crazy dream. Maybe one day! Another great review, I am headed to Japan next year. Who knows maybe I will get lucky. I hope you do! Good luck! $100 is a very fair price considering the cost of Master’s Keep. Don’t wait too long! In context, though, I can usually find W-T-01-99 RB for around 40 bucks. Any 12/101 is really good, but 99 RB is probably right on par with 2010s 12 year. True. Enjoy life in Turkey Camelot! Yeah, between that and ’90-ish Blanton’s at that same approximate price, my “everyday drinker” box is definitely checked! My previous experience with WT-99 is a 2004 bottling (which I got in trade, a 375 in fact) which was great. I just popped (literally – natch, the stopper exploded) one about 3.5 years older (Jan ’01) that I bought here. And it’s definitely even better – I did a SBS and the Jan ’01 is richer, more buttercream/vanilla on the finish, a tad more refined. My nickname for ’99 RB is “sugar and spice and everything nice” because that’s what it puts me in mind of – it’s an amazingly balanced bourbon. Great piece! I can’t bring myself to pay secondary for this stuff but your review has me teetering. I have enjoyed 12 YO Turkey from various periods, and to be honest I have NEVER had a bad one. I have a bottle of the last batch of 12 YO on my shelf unopened, as well as a genuine Split label with the Turkey on the bottle looking straight at me. Can’t wait to compare the two. A couple of years ago I was blessed to crack a bottle of pseudo split label, and it was totally faultless. Perhaps 12 YO is my personal favourite apart from the sublime Tribute and American Spirit. I agree Rare Bird, a regular run of 12 YO would be a huge step in the right direction, though I suppose the flavour profile from the 90s which I love so much is gone forever. The old profile might be a memory but the whiskey Wild Turkey is making now is just as awesome, barrel depending. I, like you, hope for the return of 101/12. Fingers crossed we’ll see that down the road as more stocks come of age. Great write-up and review! While 12-year WT is discontinued, because this was the most recent label, it is the most likely one to be found in wayward shops in Japan (or in exorbitantly overpriced ones). It’s interesting how the 12 year evolved over time. With US demand for Bourbon ramping up, it’s easy to see why this label was discontinued. With any luck, the powers that be will see the attractiveness of a throwback label to cash in on the nostalgia factor. It is very interesting how the 101/12 profile evolved, much like the 101/8 profile (in relation to change, not taste). I’d love to see this show up again, but until then I’m extremely grateful for the bottle I have. If I’m able to secure another down the road, awesome! If not, great memories! I’m getting skun on secondary prices for Dusty Turkey in Australia. When I’m old and munted, I’ll probably look back with feelings of regret over all the old classics which I didn’t try, so I’m all in. Licorice, Apricot, Leather, Apple and even custard in American Spirit. I would love some feedback on American Spirit, as it is not overly popular with many Turkey fans. I love it and thought it absolutely murdered Tradition. It’s on my list and I’m looking forward to it as well. Cheers!